The Utah Transit Authority (UTA) encourages the public to avoid traffic and parking congestion this weekend by taking TRAX and FrontRunner to the General Conference of The Church of Jesus Christ of Latter-day Saints. The City Center and Temple Square TRAX stations provide the closest access to the LDS Conference Center. TRAX service runs every 15 minutes, as scheduled, with extra trips departing from Sandy Civic Center to City Center at the following times: 8:19 a.m., 8:34 a.m., 8:49 a.m., 9:04 a.m., 11:49 a.m., 12:04 p.m., 12:49 p.m., 1:04 p.m., 3:49 p.m., 4:04 p.m., 4:49 p.m., and 5:04 p.m. At least two extra trips from City Center to Sandy Civic Center will run following each session. Extra cars will be added to all Sandy/Salt Lake trains for additional capacity. FrontRunner service runs every 60 minutes. TRAX trains depart Salt Lake Central Station for Temple Square every 15 minutes. TRAX service runs every 20 minutes, as scheduled, with extra trips departing from Murray Central to City Center at 8:21 a.m., 8:41 a.m., and 9:01 a.m. for the morning session and from Sandy Civic Center to City Center at 12:29 p.m. and 12:49 p.m. Two extra trips from City Center to Sandy Civic Center will run following each session. Extra cars will be added to all Sandy/Salt Lake trains for additional capacity. Early service will also be provided on the University line with two additional trips departing Medical Center to City Center at 8:02 a.m. and 8:22 a.m. Regular service from Medical Center will begin at 9:22 a.m.
FrontRunner does not run on Sunday. For detailed schedule information, visit www.rideuta.com or call 1-888-RIDE-UTA (743-3882). 1) Now, there is no doubt. Amtrak doesn’t want to be in the passenger railroad business. Last week Amtrak released a requested study on Ohio’s “3 C” corridor, which runs from Cleveland to Cincinnati via Columbus and Dayton. And, Amtrak released a preliminary draft for discussion for the much-awaited Pioneer route restoration between (Chicago), Denver, and the Pacific Northwest. The part of the route from Chicago to Denver would travel over the existing California Zephyr route, but from Denver westward it would be a restored route. We will examine each proposal, with the Ohio examination coming in the next issue of This Week at Amtrak, but it’s clear Amtrak is pricing the costs of these routes so high it’s trying to discourage backers and political entities along the route it really doesn’t want to create or restore either of these routes, much in the vein it did with the previous Gulf Coast report earlier this summer. Yes, of course, any good businessman makes a presentation which is conservative on sales projections, and high on costs. That way, when things work out like they are supposed to beyond the projections, there are no nasty little surprises. But, Amtrak has gone to such extremes in both of these instances, one can only begin to guess at the metrics Amtrak used to create these studies. Good business sense certainly never came into play when putting these studies together. One consistent component of these two studies and the previous Gulf Coast study is Amtrak expects individual states to pony up money for these trains, and doesn’t seem to assume any responsibility for being a national passenger train operator, which transcends state boundaries. 2) To read the Pioneer preliminary report asking for comment before final submission to Congress on October 15th is to truly understand corporate shallowness. For years, Amtrak has gotten away with running the Empire Builder with a Portland, Oregon section separate from the Seattle section by splitting and joining the train in Spokane, Washington. Just as Amtrak does also with the Boston section of the Lake Shore Limited separate from the New York City section, nearly a complete train is operated, minus a dining car. Both of these operations miss a huge revenue producing opportunity for a full, second frequency to operate over the majority of the route. Time and again, we know a second frequency on any route not only boosts ridership, revenues, and revenue passenger miles significantly, but it also spreads the infrastructure costs such as stations over two trains instead of one. The Silver Meteor and Silver Star on the Right Coast travel nearly identical routes between New York City and Miami, with the Star diverting from the Meteor’s route to traverse the old Seaboard Air Line Railroad route via Raleigh, North Carolina and Columbia, South Carolina, and also call at Tampa, Florida. Less than four hours is added to the running time of the Star versus the Meteor, and the payback for that is reflected in two million additional revenue passenger miles generated for the Star over the Meteor’s performance. The Silver Meteor generated in Fiscal Year 2008 $30,538,800 in revenue, 194,454,000 revenue passenger miles, and carried 319,800 souls an average length of trip of 608 miles. The Silver Star generated $28,111,900 in revenue, 196,924,000 revenue passenger miles, and carried 367,100 passengers an average length of trip of 536 miles. The Empire Builder generated $59,389,600 in revenue, 409,480,000 revenue passenger miles, and carried 554,300 passengers an average length of trip of 739 miles. The Lake Shore Limited generated $24,212,000 in revenue, 152,329,000 revenue passenger miles, and carried 345,600 passengers an average length of trip of 441 miles. 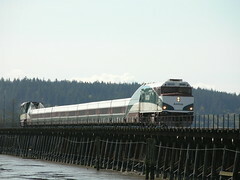 You can easily see the strength of both the Silver Meteor and Silver Star, and it’s also easy to imagine if the Portland section of the Empire Builder became the Western Star as its own, second frequency all the way to Chicago how much fiscal strength and transportation output it would generate, as would a second frequency of the Lake Shore Limited into Boston serving the same purpose. So, Amtrak’s plan for the possibility of a restored Pioneer to is add three cars to the California Zephyr between Chicago and Denver, consisting of a coach, coach/baggage, and sleeper. In Denver, a dedicated diner/lounge and separate locomotive would be added to the minuscule consist and form the Pioneer to the Pacific Northwest, terminating in either Portland or Seattle (Seattle being the better option of the two.). Amtrak projected ridership and revenue for the Pioneer is too small, too. As said above, while being conservative in projections is the best method, Amtrak projections tend more to fatalism than objectivity. Amtrak has produced four options for restored Pioneer service, Option 1 being a Salt Lake City-Seattle choice, with 102,000 passengers and $11.6 million in revenue projected. Option 2 is a Denver-Seattle choice, with 111,000 passengers and $13.1 million in revenue projected. Option 3 is a Salt Lake City-Portland choice, with 82,000 passengers and $7.6 million in revenue, and Option 4 is a Denver-Portland option with 95,000 passengers and $9.2 million in revenue projected. Option 2 is consistently the best choice, even though through Amtrak’s projections it also has the greatest cost. Option 2 restores service over Union Pacific’s fabled Overland Route through Wyoming, which would bring service to another state currently without passenger rail benefits. Much of Amtrak’s projections are based on ridership and revenues from the former Pioneer, which ceased operations in 1997. In FY 1992, Pioneer ridership peaked at 156,000 passengers a year. Amtrak states in its preliminary report it expects lower ridership because of stiffer airline competition in the region. Amtrak likes to sell itself short with silly statements like this; it never seems to understand the uniqueness of its own product and the desirability of its product among all classes of travelers. Amtrak is projecting per mile passenger revenue of 12.2 cents, which would place it only above the Sunset Limited, with revenue of 12.1 cents per passenger mile. It’s a mystery why Amtrak would use this number, since the California Zephyr generates 14.5 cents per passenger mile, the Southwest Chief 13.3 cents per passenger mile, and the Empire Builder 14.5 cents. Why there is any presumption of such a low passenger mile figure can only be explained that Amtrak doesn’t want this train to come back. The 111,000 figure for ridership is easily low by 25,000 passengers, but, if a second frequency all the way from Chicago to Denver and then a single frequency to Seattle was used because it is a better choice, then a ridership figure of 250,000 to 300,000 is more likely. Yes, this would require more equipment, but, that’s the cost of having the burden of meeting consumer demand. When you couple realistic passenger mile revenue of 14.5 cents per passenger mile as is found on the California Zephyr with the ridership of a second frequency, suddenly the Pioneer is not only a good idea, but a great idea. Perhaps Amtrak doesn’t want to do this because it is afraid of a new service being successful? After all, it’s very difficult for Amtrak today to hide the outright success of its long distance trains, so adding another train would just add to Amtrak’s problems of explaining why long distance trains always work better than state supported corridor trains with greater transportation output and greater efficiencies in every area. Training and personnel preparation is another area where Amtrak’s proposal seems to be from outer space. Amtrak wants to budget $6.6 million for crew training for Option 2. Why? Perhaps, Amtrak is considering taking kindergarten students and paying for their entire education (including advanced university graduate studies degrees) and, a lifetime later, making them train and engine crew members. The Pioneer is proposed to operate over a route that is already a freight railroad route; there is no blazing of trails going on here. Between Portland and Seattle, the route is an existing Amtrak route, so it’s just a matter of adding more crew to the crew base, not creating an whole new cadre of employees. As far as the portion of the route between Denver and Portland, it is not rocket science to recruit and train railroad employees. Amtrak has obviously based its numbers of taking raw employees off the street and turning them into railroaders, and then doubling that cost for a final project figure. In the real world, that is not only unrealistic, but just silly. On the subject of equipment, Amtrak says it doesn’t have enough equipment on the wreck line it could fix, or other cars in storage to get this service moving. It wants (like in the Gulf Coast report) up to four years to develop and build new equipment, at a cost of $123 million for an expected need (for the too short consist) of 27 cars and locomotives, total. That breaks down to over $4,500,000 for each piece of equipment. Perhaps they are projecting all of this equipment will be made of gold and platinum? This figure is way too high, plus, a few pieces of equipment could come from Amtrak’s wreck line at a much lower price for rehabilitation instead of new build. Amtrak says it needs to buy four new locomotives in this equipment group, but it has seven wrecked P42s in its inactive fleet, plus 30 stored P40s, and nine stored F40s. There are other bits and pieces of Superliner equipment Amtrak has that could easily supplement this equipment request without having to buy everything new. The report goes on and on in this vain vein. Probably, the numbers Union Pacific Railroad have submitted for track upgrades are a good starting point for a wish list, and it would help all parties concerned for some infrastructure improvement on the line. As far as station costs are concerned, Amtrak worries greatly about taking some existing buildings and having to upgrade them for Americans With Disabilities Act compliance. While this has great merit, it always seems to be Amtrak’s default position on any new project; it doesn’t have the money to spend for ADA compliance. After over a decade without service, many of the route stations have either been removed or converted to other purposes. There will be a great need for new station facilities. However, this is a reasonable expense for cities and towns that wish to have passenger rail service to share the expenses. If they want passenger rail service, provide the portal for that, just like for airlines. Amtrak says it will need $469,800,000 to restart Pioneer service, with Denver as the jumping off point. The majority of that is $324,100,000 for track and signals, including the coming need for Positive Train Control. An educated guess says this cost is $150,000,000 too high, including unrealistic training, equipment, and new station costs. By the time a realistic number is agreed upon between Amtrak and the Union Pacific Railroad, that $469 million should be closer to $320,000,000. Ridership, revenue, and revenue passenger mile projections are tremendously under-represented, and operating expenses are tremendously over-represented. When the true figures meet in the middle, farebox recovery should be in the 50% or higher range (As opposed to Amtrak’s guess of 28%). So, at this point, if you’re an elected official of any of the states hoping for a restored Pioneer, what do you do? Amtrak wants $469 million in start-up costs, and then it expects ongoing subsidies to run a train that is positioned in the most expensive way it can be to drain government treasuries. Here’s an idea. Let Amtrak submit its grossly flawed report, with all of the figures as gospel. Then, spend some more money and some more time (After all, Amtrak wants four years or more to restore this service, so to them time is not a factor. ), and find a credible passenger rail consulting firm to create a real route analysis, using real world numbers, and then take that report and beat Amtrak over the head with it until it comes to its senses and becomes realistic on what it will take to restore the Pioneer as part of its long distance system. 3) Here is the most compelling part of the Amtrak Pioneer report. These projections reflect the fact that all or virtually all of the equipment required for Pioneer restoration would have to be purchased new. Despite growing ridership, Amtrak’s long distance equipment fleet is smaller now than it was when the Pioneer operated. Due to funding constraints, Amtrak has not ordered any new long distance equipment since the early 1990s, and most of the “Heritage” cars built for other railroads that Amtrak acquired at its formation have been retired due to age. Amtrak’s existing fleet of bi-level Superliner cars is insufficient to meet equipment requirements on the nine long distance trains that currently use Superliner equipment, and Amtrak has only a small number of repairable “wreck status” Superliner cars. In addition, if Amtrak is to continue to provide existing services on long distance routes, it must in the very near future replace nearly 100 remaining “Heritage” cars that are now more than half a century old. Amtrak has recently issued a request for proposals for the acquisition of 130 single-level long distance cars, primarily to replace the remaining Heritage cars (although funding for this purchase has not yet been identified). Purchasing additional single-level cars to equip a restored Pioneer would not be an optimal solution. Single level cars would accommodate fewer passengers, and operation of single-level Pioneer cars to/from Chicago on the bi-level California Zephyr would trigger a need for additional Superliner “transition” cars (which are in particularly short supply) equipped with a high-level door one end and a single-level door on the other. A purchase of new bi-level equipment for the Pioneer, which would take approximately four years for design, procurement and construction, would have to be part of a larger equipment order. The high upfront design and tooling costs associated with building passenger rail cars make it uneconomic to construct them in small quantities. Amtrak is preparing a comprehensive equipment fleet strategy that will, among other things, address the existing shortage of bi-level Superliner cars that limits capacity on Western long distance trains. An order for new bi-level equipment, which would be subject to funding availability, could provide the means to acquire additional equipment for new services such as a restored Pioneer. What is Amtrak saying, here? Has Amtrak actually said – in writing, in an official document, no less – it has demand for long distance trains that is not being met? (Gasp!) Could this be true? Amtrak has unmet demand on trains which are not corridor trains? Could this be a whole line of revenue Amtrak is ignoring? What about taking more cars out of the wreck line and storage yard and putting them into service? Would that imperil Amtrak’s ongoing business plan which is to mainly request government subsidies instead of generating revenue inhouse? (Gasp! again) NEW SERVICES? Our Amtrak? Is someone actually preparing a vision for the future for Amtrak? Inquiring minds want to know. 3) While you’re trying to wrap your mind around that concept just above, here’s an editorial which is appearing in the October 2009 issue of RAILPACE Newsmagazine, which is appearing on news stands today. This commentary is by Tom Nemeth, Editor-in-Chief of RAILPACE, and is used with his permission. Now that Amtrak has adequate funding for operations and growth, while enjoying unprecedented public and political support, it is time for a management makeover. Amtrak service today, with a few exceptions on some western long-hauls and the Acelas, is beginning to look like the final days of Penn Central. While top management obsesses about photographers, on-time performance continues to lag, trains are dirty, shopworn, and overcrowded. What is the meaning of a “reserved train” when passengers are required to stand between Wilmington and Washington, as a friend did on Train 94 on a recent Friday. This editor endured a Business Class coach from Trenton to Newport News on Train 99 on March 28 with reeking toilets. A round trip on the Texas Eagle on June 15 and June 23 last year, in addition to being 8 hours late each way, revealed shopworn Superliners badly in need of a facelift. Another colleague, writing Amtrak in protest of a rather rude trainman, was advised that Amtrak management is not responsible for the behavior of its crews. Granted that working a crowded train is not easy, but there must be recognition that the company (and Federal funding) exists for the benefit of Amtrak’s customers, the riding public. In short, it appears that top management just doesn’t care. There are other Amtrak customers too. The commuter railroads whose spine is the Northeast Corridor, are not treated any better by Amtrak’s insular management.The faulty design of the ARC rail tunnel now being built under the Hudson River, which will not connect to Penn Station in Manhattan, is partly the fault of Amtrak, which did not want a seat at the table when the project was in initial design, a fatal flaw that will haunt regional rail advocates for generations. Amtrak management just didn’t care about “NJ Transit’s tunnel.” New York’s MTA continues to struggle with Amtrak’s inability to execute its responsibility for the Long Island Rail Road East Side Access project. This represents a lack of accountability by Amtrak management, who are in a unique position to influence the outcome of these multi-billion dollar investments. Amtrak’s own engineering department continues to lack competent leadership, allowing substandard quality concrete ties onto the Northeast Corridor (now being replaced at great expense), and serious structural cracks in a bridge in Elizabeth, NJ, to go unnoticed by inadequately trained maintenance workers. But where IS management? Corporate culture on Norfolk Southern and other successful railroads dictates that Division Superintendents and Engineering Department officers are not to be found sitting in their offices; rather they get out and ride the trains regularly and observe the property firsthand. On Amtrak, they sequester themselves behind desks and await their long-sought retirement day. Then there’s the issue of Amtrak operations. Shrinking consists in an era of growing ridership hardly makes sense. Amtrak’s “One Size Fits All” policy for its long-distance trainsets is also bizarre. One would expect that Western train consists would swell in the summer months, while Florida bound consists would lengthen significantly in the winter season. Amtrak’s culture is one of meetings and seminars, and hiring consultants to produce “studies” for a laissez-faire management that doesn’t want to work to resolve the issues themselves. Meanwhile, Amtrak’s lethargic bureaucracy continues to balloon. The agency continues to be a dumping ground for failed bureaucrats and retirees from other government agencies eagerly awaiting retirement. In fact, many already seem to be there. Nearly a year after the U.S. election, Amtrak still does not have a corporate Strategic Plan for growth. As of this writing, management still does not have a Fleet Plan in place, nor new equipment on order. Management has become so moribund that Joe Szabo, the recently-appointed Administrator of the Federal Railroad Administration, recently had to direct Amtrak Acting President Joe Boardman to come up with a Fleet Plan. Hello. Amtrak’s Bush-era management team has become more insular and combative, and dismissive of its long term supporters and customers; witness Amtrak’s illegal Photography Ban, perhaps the Boardman Administration’s only “accomplishment” this year. Boardman, a career bureaucrat, disdains individual discussions with media editors and freelance photojournalists concerning Amtrak’s strategic plans and initiatives, and has refused to acknowledge communications from citizens and customers regarding Amtrak’s Photo Ban. Change must start from the top, and there are a number of great rail executives who stand ready to lead Amtrak out of its chaos this fall, when Acting President Joseph Boardman’s term is finished. These luminaries include Gene Skoropowski, managing director for California’s Capitol Corridor Joint Powers Authority, the agency responsible for intercity passenger rail service linking Sacramento with the Bay Area. Skoropowski has spearheaded growth and development of intercity and corridor passenger rail in California, including implementation of CalTrain’s “Baby Bullet” trains. Peter Cannito, former Executive Vice President of Engineering at Amtrak, and retired president of Metro North Railroad, brings a wealth of engineering expertise. Dennis F. Sullivan, former Amtrak Executive Vice President, is a seasoned Operations railroader who will bring customer focus to Amtrak. These three individuals form the backbone of a team that will inspire performance among Amtrak employees and get the company moving forward. While politics is a necessary aspect of Amtrak’s presidency, it cannot be the only aspect. It is essential now to rebuild Amtrak’s management team, to run the company as a railroad and as a business, to achieve a vibrant and growing national system. The U.S. had an extensive passenger rail system until the 1960s, when financial losses caused for-profit railroads to jettison their passenger services. Now that Federal and State governments have begun to accept responsibility for funding a national passenger rail system, there is growing support for breaking the 38-year old Amtrak monopoly on intercity passenger service, and allowing freight railroads and/or private operators to take over Amtrak routes, or even launch new services. This may be the Amtrak Board’s last chance to install competent, growth– and customer– oriented management, or the current groundswell of public and political support for passenger rail— and Amtrak’s monopoly of it— may soon come to an end. Okay, Amtrak, more and more people in the non-Amworld are wondering what you’re up to; the “business as usual” status quo is no longer acceptable. Do something. The days of laying around and whining about the world being so terribly unfair are over. You’re expected to perform, just like everyone else. 1) Word has come from Gil Carmichael, former Federal Railroad Administration Administrator and Chairman of the Amtrak Reform Council. DENVER, CO, September 18, 2009 – In recent comments to the 68th Annual Meeting of the Southeastern Association of State Highway and Transportation Officials (SASHTO), held in Biloxi, Mississippi, Gil Carmichael, Founding Chairman of the Board of Directors of the Intermodal Transportation Institute (ITI) at the University of Denver, said the key to solving the nation's 21st century transportation problems lies in establishing a holistic approach funded by two, new intermodal trust funds – one for freight movement, the other for passenger transit, and both based on miles traveled. Speaking to a technical session of 1,200 government and association members from 12 states and the Commonwealth of Puerto Rico, addressing today's transportation challenges, Carmichael said the nation needs to establish an ethical and sustainable "intermodal" transportation system that incorporates both freight and passenger rail in order to produce a new transportation structure that meets 21st century needs. This system should be a joint public- and private-sector initiative that builds and expands upon the success of the Interstate Highway System of the last century. "The Interstate Highway System that was built has served us well," he said. "But today we have a population that has doubled in 50 years; we have a deteriorating and badly congested transportation infrastructure that cannot meet consumer demand; and we have a growing global economy that requires interconnected, intermodal transportation. The solution to meeting this century's challenges lies in building 'Interstate 2.0', an ethical, fuel efficient, intercity, rail freight and passenger transportation system that reconnects our center cities, bus and transit lines, energizes our economy, and sustains our environment. It is a logical and necessary next step forward." • Develop a Holistic Transportation Policy. "Historically, this nation has had a 'single mode' mindset." he said. "Our federal government and state DOTs have not addressed transportation as an interconnected, intermodal system, choosing instead to address each mode independently. That myopic approach will no longer work in our global business environment. Today, the public and private sectors need to partner and address our transportation requirements as they relate to two intermodal modes – freight and passenger rail. This involves utilizing our 240,000 miles of existing (and paid for) rail Rights of Way (ROW) and upgrading about 30,000 miles of it to high-speed, grade-separated track. We should provide the private railroads with a 25 percent investment tax credit to encourage them to upgrade and double- and triple-track their main lines to increase speeds and double capacity. A high-speed rail network that reconnects our center cities, major airports, and ports is vital to 21st century transportation and economic development." • Create Two Intermodal Trust Funds. "One of the dilemmas we are faced with is: how do we pay for this intermodal system?" he asked. "We paid for the Interstate Highway System with a highway trust fund from gas tax usage. The gas tax worked well for the highway and it is about to expire. To replace it, I strongly recommend the U.S. put into place two, new intermodal trust funds to pay for this new multimodal transportation system. There would be one tax for intermodal freight movement and another for passenger transit. And it would be simple to implement cost per mile traveled rather than cents per gallon." • Reorganize State DOTs to Oversee Intermodal Transportation. "With a new intermodal transportation system in place, we should reorganize our state DOTs so we have two separate departments that are responsible for intermodal freight transport and passenger transit, respectively," he explained. "We can no longer afford to administer effective transportation policy on a single mode basis. States would also build or lease high-speed track on the private railroads' ROWs to allow new, modern, intermodal freight and passenger trains." • Increase Freight Capacity and Stimulate the Economy. "A major public-works project of this magnitude will add millions of new and permanent jobs, will produce a prosperous economy, just as Interstate I did, and will build a long-lasting, truly sustainable transportation system," said Carmichael. "We can electrify the rails by mid-century, producing a new source of energy and weaning ourselves off of our dependence on foreign fossil fuels. It will then be an ethical and sustainable system that increases freight capacity and protects our environment." In closing, Carmichael said: "A new holistic, ethical transportation policy will build upon the strengths of each mode, will reduce injuries and deaths, will be environmentally benign, will not waste fuel, will not cost too much to use, and will provide ongoing economic stability. This 21st century intermodal transportation infrastructure will use the ‘steel wheel and steel rail’ – the same as it did in the 19th century – as its fundamental element of transport." The Intermodal Transportation Institute at the University of Denver offers an Executive Masters Program that awards a Master of Science in Intermodal Transportation Management from the University of Denver. This graduate degree program prepares transportation industry managers for the increasingly complex, global business environment where knowledge of finance, quantitative processes, supply chain, law, and public policy issues as well as freight, passenger, and intermodal transportation operational strategies are critical management tools for success. For more information on the ITI Executive Masters Program call: 303-871-4702 or visit: www.du.edu/transportation. Whatever plan moves us into the future – and Mr. Carmichael usually has the sharpest eye on the future – is going to have to find new ways to pay for the next generation of railroads and highways. The original highway trust fund at one time was sacrosanct, and left alone. Too many uninspired members of Congress kept looking at the pool of money and thinking about how many local pork barrel projects in their districts could be funded with someone else’s money, and ever since then, the highway trust fund lost its integrity. If Congress has the will to plan correctly for the future, it will have the necessary nerves of steel to set up new funding mechanisms which again become sacrosanct and are dedicated to the very important cause of surface transportation. It’s time for Congress to adopt the stepchild and call it its own. 2) The gun haters are going nuts. This week, the Senate passed a bill requiring Amtrak to restore the rights of gun owners to transport guns on Amtrak under proper safety precautions in baggage cars. To read some of the hilarious, delirious ravings of the gun haters, you would think the Senate is inviting known terrorists to a tea party and asking them to bring along their weapons of choice. Amtrak used to allow guns onboard trains in baggage cars, prior to September 11, 2001. Since then, Amtrak – acting on its own after 9/11 and the later Madrid train bombings – banned guns from its trains. However, the Senate, in an overwhelming majority vote, has told Amtrak either figure out a way to get the guns safely and securely back on trains, or your free federal monies go away, as soon as March of 2010. The gun haters, with great whining and gnashing of teeth, have said it’s impossible to make this happen. More rational people have reminded one and all we have this controlling document in our lives as Americans – it’s know as the Constitution for those who may have forgotten about it with everything going on in Washington these days – which plainly and loudly says Americans have the right to own and carry guns. These same rational people also like to point out the TSA (Those same passenger-friendly people who love to watch us take off our shoes in airports.) already has lots of plans in place for things like guns on Amtrak. The sooner they return, the better. 3) Union Pacific Railroad, the railroad everyone thinks loves to hate passenger trains, apparently is willing to make some money embracing one particular passenger train. The Chicago Tribune reported today, in a story datelined Denver, the Ski Train may be back this winter, operating between Denver and the Winter Park resort. Previously operating for 69 years, the Ski Train was thought to be dead when its previous owner ended the operation and sold his passenger rail equipment to a Canadian scenic passenger operator. In came Iowa Pacific Holdings, with former Amtraker Ed Ellis now as President of Iowa Pacific, and the Ski Train is back on schedule. Iowa Pacific operates other short passenger routes, mostly as scenic and entertainment trains. Mr. Ellis said Iowa Pacific would use Iowa Pacific equipment and contract with Amtrak to provide train and engine crews. A deal has not been finalized with Amtrak. Okay, let’s take a roll call. Union Pacific, which, through its official spokesman once described Amtrak as “novelty transportation,” is striking a deal with an operator to allow a seasonal, regularly scheduled passenger train operate over its tracks, which it could have easily let go away after the original operator pulled out. Then, Amtrak, which sometimes thinks of itself as “novelty transportation” instead of being an important part of our domestic surface transportation network, is in the process of cutting a deal with someone else to run passenger trains. Gosh (gasp! ), could capitalism in passenger rail be rearing its allegedly ugly head and someone has figured out how a passenger rail operation can make money for all parties concerned? What’s wrong with these people? Aren’t they listening to all of the alleged experts that continuously drone on and on and on that only government is capable of running any sort of passenger train in the proper manner (Which means at a loss.)? 4) Lots of mail came into the This Week at Amtrak e-mailbox after the last issue of TWA calling for another operator to replace Amtrak. As the British would say: "Here, Here" to your latest newsletter! What about a new corporation formed by a consortium of freight railroads to run a national passenger railroad system? Since there is little more consolidation to be done between the big boys, perhaps the congress and courts would approve such a novel arrangement as there would be no freight competition issues. The freight lines would benefit from aid in infrastructure construction, and having open knowledge of all passenger operations, the freight lines would certainly be more flexible in schedule development/alternate routes even over competing lines since the passenger business would benefit all of them. Now, that "by George" would be a nice trick to pull off, especially since it might even make sense! The message both Joe & Joe (Boardman and Biden) should hear is: If you can't do it right, don't do it at all. Give it up! I like the idea of shutting-down Amtrak, but suggest a slight variation. Keep Amtrak in operation. However, quarantine Amtrak between Washington, DC; Boston, Springfield, Massachusetts; Albany, New York; and Harrisburg, Pennsylvania. Transition the remainder of the inter-city passenger rail network, and the franchise rights for additional rail services, to one or more other entities. If Amtrak believes their NEC is so profitable and is the only part of their network deserving investment, as demonstrated by their actions, and trains in the remainder of the country are bleeding amounts of red-ink exceeding the combined inventory of all retail stationery stores, give Amtrak what it wants! Let's see how long Amtrak can survive with the NEC and a reduced or zero subsidy. 5) And, finally, this advertisement for a vacant position for a qualified person at Amtrak came floating in to TWA. Description: THE SAFETY OF OUR PASSENGERS, OUR EMPLOYEES, THE PUBLIC AND OUR OPERATING ENVIRONMENT IS OUR HIGHEST PRIORITY! -Serve as the conscience of Amtrak. -Work with Amtraks Board of Directors and the Congress to improve program management. -Maximize the positive impact and ensure the independence and objectivity of Amtrak OIGs audits, investigations and other reviews. -Use Amtrak OIGs investigations and other reviews to increase integrity and recommend improved systems to prevent fraud, waste and abuse. -Be innovative, question existing procedures, and suggest improvements to programs. -Where appropriate, build relationships with program managers based on a shared commitment to improving program operations and effectiveness. -Work with Amtrak to address company-wide issues, both independently and collectively. EDUCATION: An undergraduate degree is required. PERFERRED EDUCATION: An advanced or Masters degree in an applicable field is preferred. -Be an independent-minded leader who possesses the integrity to ensure Amtrak’s full compliance with the IG Act. -Either be a sitting Inspector General or Deputy Inspector General, or have recent similar experience. -A minimum of 10 years cumulative progressively responsible administrative, managerial and supervisory experience that provides extensive knowledge of auditing and inspection practices, law enforcement policies and procedures, accounting, internal controls, financial analysis, law, management analysis, public administration, and/or investigation techniques. -A comprehensive knowledge and understanding of the audit, investigation and evaluation standards issued by the Council of Inspectors General on Integrity and Efficiency and the Government Accountability Office. -Direct experience working with upper management, the media and Congress. -Significant experience in management and a thorough understanding of Federal and IG audits, investigations, law enforcement and evaluations involving large scale companies and operations. -Evidences familiarity with the Comptroller General's auditing standards. -Ideally, have an understanding of railroad operations. -Strong analytical skills and judgment to support critical decision making. -Unquestioned ethical standards, high level of integrity, sound professional judgment, strong leadership skills, an understanding of business acumen, a high level of common sense and the ability to think logically. -The ability to work under pressure and make sound decisions with limited information. -Significant experience with leadership, human capital, and managing budgets. -The ability to build a strong team; the IG should not be intimidated by a talented staff. -Strong coalition-building and interpersonal skills to form solid relationships both internally and externally; s/he can work through internal conflicts and/or disagreements successfully. -Excellent written and oral communication skills, including a strong ability to present to audiences both large and small. -High energy and committed work ethic. -No personal or professional relationships with Amtrak that would hinder the candidate's ability to be objective and independent with respect to audits and investigations of Amtrak and its operations. OTHER REQUIREMENTS: The Amtrak Inspector General will have the responsibility of assuring best practices in the Amtrak OIG. The Inspector General will supervise over 90 OIG employees in conducting independent, objective audits, evaluations and investigations relating to Amtrak programs and operations. This individual must demonstrate credibility, integrity and objectivity, be a strong communicator internally and externally, and have extensive relevant experience. The successful candidate will have a strong commitment to the Amtrak mission. The candidates commitment should reflect an interest to help build the Amtrak enterprise, creating best practices for a "first class" organization for the passengers, employees and stakeholders. The successful candidate must also demonstrate an equally strong commitment to implementing all requirements of the IG Act. AMTRAK EMPLOYEES MUST COMPLETE A JOB OPPORTUNITY APPLICATION TO APPLY FOR THIS POSITION. Well, Amtrak ASKED for all of the right things. It’s another story as to whether or not the new IG will be able to accomplish anything without the type of interference which seems to have occurred in the immediate past. 1) The late Austin Coates, the founder of United Rail Passenger Alliance, was known to one and all as a courtly, Southern gentleman. Always quick with a friendly handshake, and at a times a poignant pause which was sincere in every way, he did have his grumpy moments in his later years. When Amtrak had been particularly naughty, he was known to say, “They ought to just pull ‘em over and park ‘em,” referring to Amtrak’s trains serving the various united states. It’s hard to say at this moment what Mr. Coates would say about Amtrak’s naughtiness, but, in honesty, it may not be entirely fit for a family publication, such would be his many frustrations with Amtrak today. Actually, his “pull ‘em over and park ‘em” may be just what needs to happen. After that happened, then the parked trains should have a new paint job slapped on them (a la Amtrak Day, May 1, 1971), and a new operator should take over Amtrak’s route system; an operator which would actually be interested in running passenger trains. Veolia? Herzog? Virgin? Where are you? We need you. We have all been waiting months for Amtrak, with its fourth president (And, the current one only an interim president.) in less than 10 years, to come up with some – any – vision for the future. It hasn’t happened. Reports have come (See the last issue of This Week at Amtrak.) Amtrak really isn’t interested in “slow trains,” but wants to jump into the high speed rail game, and place all of its focus there. Since Amtrak can’t properly operate a conventional speed passenger rail system effectively, what proof is there Amtrak can operate a high speed rail system properly? And, this one rather significant fact comes into play: High speed systems need conventional speed rail feeder system to make them work efficiently. Since Amtrak hasn’t accomplished that first, well, why would anyone with a rational mind entrust them with a whole new set of trains? So, here’s the rational thought. If Amtrak management wants to go chasing after the future of high speed rail and compete with the likes of the successful European operators, we should let them. Shovel a few million bucks their way every year to keep the team together, and let them plot and plan to their collective hearts’ desire. It would be cheap by anyone’s measure to pay these folks to do something different. While current Amtrak senior managers can work themselves silly in their new offices, real railroad managers, who not only know how to run a railroad, but WANT to run a passenger railroad, can take over Amtrak, and run and grow and expand the company the way it deserves to be run. Veolia? Herzog? Virgin? Are you there? All of these people like to run trains. Why not let them? Here is what one TWA reader had to say after publication of the last TWA. Here's a thought: why not simply invite TALGO to carefully replace train by train, line by line Amtrak's existing network, with TALGO assuming all maintenance on all Talgo equipment? The argument that TALGO can't use the NE Corridor's high level platforms is ridiculous; back in the mid-50's the New Haven Railroad's Talgo (John Quincy Adams) loaded and unloaded at the high level platforms in Grand Central Terminal on a daily basis. A Talgo SILVER METEOR or a Talgo LAKE SHORE LIMITED are not difficult to imagine (including sleeping and dining facilities) and the Talgo tilt-feature would allow cuts in running time on EVERY route on EVERY train (imagine what a TALGO could do on the curvy route of the CARDINAL). TALGO is existing, proven technology THAT WORKS. Washington state's Talgo CASCADES have a stellar record of reliability and passengers love them. Best of all, they're relatively INEXPENSIVE. What's not to like? As for FRA regulations, I have faith that serious Talgo engineering should be able to come up with acceptable solutions to all concerns about crashworthiness and safety. Kind of makes you think, doesn’t it? 2) Who would be winners, and who would be losers in this process? What would it take to make this happen. First, it would literally take an act of Congress. Congress created Amtrak, Congress keeps Amtrak alive, and Congress can transfer Amtrak to another management team. Second, this is a no-brainer for Amtrak’s unions. Beyond Amtrak headquarters in Washington and the Northeast Corridor, there is literally an entire country full of Amtrak union workers who would love to have an expanded system to work on and help grow. A more aggressive passenger rail management would certainly require more workers, creating more union jobs. Third, Amtrak’s current suppliers probably wouldn’t care who they sell to, as along as they are selling. No love lost there. Fourth, Amtrak’s current state partners often question Amtrak’s rather high-handed approach to “partnerships,” and most likely would enjoy working with a more professional organization like Veolia, which already has contracts with over 500 cities and states around the world to run transit system. Fifth, just to use on example, Veolia, under the leadership of Executive Vice President Ron Hartman, is filled on its front lines with some of the best ex-Amtrakers in the country (Mr. Hartman himself is a former Amtraker.). Sixth, turning over the keys to the kingdom would be much easier today than it was on May 1, 1971; after all, a company completely in place is much easier to transition than putting together a new network made up of parts from over a dozen older networks. We have all had enough of Amtrak’s foot dragging, whining, and inability to operate passenger trains in a professional manner. Amtrak has espoused no vision for the future, and somehow expects all of us to simply fall in line to what it says, without relevant questioning. It’s time for that to stop. It’s time for someone to be proactive. It’s time for Amtrak as we know it today to come to an end, and a new operator for America’s tattered and tottering passenger rail system to come to the front and take over. Every taxpayer in America will be better for it, and every Amtrak employee will have new, better employer with the ability to pay prevailing wages and offer better security. All it takes is – literally – an act of Congress. Call your congressman and senators today. You will be glad you did. 1) You never know what is to be found on the private United Rail Passenger Alliance Intranet. Here is one of the offerings from Labor Day weekend. Today was the first of the two day "Railfest 2009" held at Steamtown NPS in Scranton, Pennsylvania. Amtrak sent along one of each: P42 locomotive, Amfleet I coach, Amfleet I lounge, Viewliner sleeping car. In the lounge was an Amtrak intern; an astute young man with hope in his soul that has yet to be crushed. I discovered – as I suspected – the current Viewliner RFP is more an exercise of purging the last of the Heritage cars than an expansion of service. But, I asked why there hasn't been a push for more Superliners. The thought process is looking toward HSR and not buying "slow trains". Does Amtrak understand it is in the fight of its life? There is no doubt in my mind something will be built in this country. Perhaps there will be a fleet of Talgo designed trains running to and through various places in the Midwest. Talgo already performs its own maintenance. It's not much of a stretch for someone other than Amtrak to run the trains. If the Midwest does succeed in obtaining the requested 31 trainsets it wants through stimulus money and necessary motive power, that would be quite the interconnected network. A network of such size would probably warrant the attention of a larger player such as Sir Richard's Virgin Rail. How does Amtrak intend to compete with that? Point to the fab job they have done with the Northeast Corridor? And, as with most topics on the URPA Intranet, there was follow-up discussion. Amtrak says they don't want to buy any slow trains? Then that pretty much leaves them with no place to go. Any TGV-style fast trains would have to be a new start. Leaving aside the lessons we learned from the Florida Overland eXpress (FOX), we here in Central Florida have also learned to avoid any new start project that involves Amtrak. So Amtrak is left with 79 MPH trains on freight railroad tracks, which is theirs only because of their statutory access to the tracks. If they don't want that, and they've made it abundantly clear that they don't want it, then they have no purpose at all. They will end up like the proverbial lazy man who dies with his hand in a banquet bowl. When it comes to an alternative operator, the freights remain free to indulge their most paranoid liability scenarios — effectively ignoring the existence of the federal cap. This is what produced demands aimed at North Carolina and Virginia for liability coverage in the $300 million to $600 million range. His report certainly explains why Amtrak has produced no vision for the future – because it chooses not to have one, based on the assumption it will be the high speed rail operator. Considering how many European companies have said they are going to jump in with lots of expertise, well, Amtrak is very, very wrong if it thinks its few buddies in Congress are going to protect it. At the height of the Battle of Britain when RAF Fighter pilots were barely holding their own against the Luftwaffe, guess what the Air Marshals of the RAF wanted as the priority construction: Bombers. At this time most British Bombs rarely got closer than five miles of the target. The peace time RAF was dominated by Bomber Pilots. Even in war they couldn't give up their ideology. This is true of most large organizations. There's a perfectly logical explanation. Amtrak, from deep in its corporate DNA, doesn't want to change and grow, and its congressional and executive branch enablers will continue to let it get away with it. Therefore, it's perfectly happy to limit its equipment orders to deep-sixing the last of the Heritage fleet: the dining cars and baggage cars. Status quo maintained. I think, as long as the NEC gets its cut of the HSR largess, Amtrak will be perfectly happy on that front, as well. And, many a few more states will step up with operating subsidy handouts. With true HSR on the European and Asian models (on separate, non-freight and presumably publicly-owned right of way), Amtrak's historic and statutory advantages mean very little. Amtrak brings little to the table in terms of expertise or competence. So, Amtrak's "drift," while blinkered and execrable, is completely rational, from Amtrak's point of view, given the history. Amtrak has its own inertial guidance system that many have tried, and failed, to correct. Perhaps this explains why we hear no vision statements from Amtrak; they have none, other than to glom onto more government money for high speed rail in the future. In the mean time, Amtrak’s current fleet just keeps shrinking and shrinking, no matter how much money it pours into passenger car and locomotive rehabs. Until a substantial order is placed for new equipment, no real, long term growth is possible. If Amtrak does plan to not grow its existing system, or, eventually exit the “slow train” business, then it needs to let us know that, right now, so other people – with a true entrepreneurial bent – can step in and run Amtrak’s existing system properly. If Amtrak doesn’t like what it’s doing now, let someone else do it, and probably do it better. 2) Norfolk, Virginia’s Virginia-Pilot daily newspaper reported on Wednesday Norfolk Southern Railway projects the cost of putting conventional passenger trains on its freight tracks between Petersburg, Virginia and Norfolk at $75 million, much less than the Commonwealth of Virginia’s estimate of $262 million. A spokesman for the Commonwealth said the figure included costs for stations and other costs not included in the NS figure, but it’s hard to visualize the few, small stations along that mostly rural route costing tens of millions of dollars. Towns along that former Norfolk & Western mail line south of Petersburg include (north to south) Disputana, Waverly, Wakefield, Ivor, Zuni, and Windsor, before you arrive in the larger area of Suffolk. If you’re not completely familiar with those Virginia towns (Even though Zuni was the town where the Planter’s Peanuts silo burned back in the mid-1960s, and Wakefield is home to the Virginia Diner restaurant. ), understand these are mostly tiny towns with four and five building “downtowns” spread on each side of four lane highway Route 460, serving nearby peanut, soybean, cotton, and hog farms. So, it’s unlikely an expensive station infrastructure is necessary for any of these locations, other than Suffolk, or Norfolk itself. A spokeswoman for NS said the $75 million figure for improving the corridor is half the company’s early estimate. Deborah H. Butler, NS vice president of planning and chief information officer, said Norfolk Southern supports sharing its railroad right of way with passenger trains, but the company would only help pay for infrastructure improvements if there are benefits to their freight service. That stance is not unreasonable; if a railroad has all of the capacity it needs for its own customers, then any incremental improvements have to come from a source outside of the railroad. That’s only good business and good public policy. 3) William Lindley of Scottsdale, Arizona has some further thoughts. In recent weeks we have looked at how a nationwide matrix of passenger trains would work effectively. Some of our readers have asked about timetables. This is natural, because in recent decades many advocates have obsessed over how Amtrak's skeletal system could be tweaked by adding a single train here, or adding one stop there. Contrariwise, the whole point of the late Dr. Adrian Herzog's proposal was a proper grid – a matrix – of trains, with multiple daily departures, largely removes the need for clever scheduling and obsession over microscopic details. But, hark! In a sufficient network, small changes can make huge differences: let's look at an historic timetable that was a pinnacle of efficiency. In the autumn of 1965, the St. Louis and San Francisco Railway (Better known as the Frisco.) had reduced its passenger fleet to the principal two of its mainlines, these being arranged in a large X and centered on Springfield, Missouri. Frisco ran one daily train from St. Louis to Oklahoma City, as well as daily departures from Kansas City to Birmingham, Alabama. Train 1, The Oklahoman, departed St. Louis at 8:55 A.M., arrived Springfield at 2:35 P.M., departing there at 3:10 P.M., and arriving Oklahoma City at 11 P.M. The next morning, that same set of equipment departed Oklahoma City as Train 2 at 5:45 A.M., to Springfield arriving 1:40 P.M., and departing at 2:35 P.M., and returning to St. Louis at 8 P.M. This is 542 miles each way, with daily departures, requiring two sets of equipment. Train 101, the Southland, departed Kansas City at 9:40 A.M., arrived Springfield 2 P.M., and departed there 2:45 P.M., called at Memphis 9:45 P.M., and arrived Birmingham 6:15 A.M. the next morning. That equipment departed as Train 102 at 10:30 P.M., called at Memphis at 6 A.M., arriving at Springfield 2:15 P.M., with a 3:20 P.M. departure for Kansas City where it arrived at 7:40 P.M., ... in plenty of time to turn for the next morning's departure. That's 737 miles each way, with daily departures, requiring three sets of equipment. In total, the five trainsets together averaged over 500 miles per 24-hour period, including even sitting still overnight at the ends of the line. Returning briefly to today, compare this to the Piedmont train in North Carolina, which Amtrak operates on behalf of the State of North Carolina. The Piedmont makes a single 173-mile daily round trip, or 346 miles per 24-hour period, running between Charlotte and Raleigh. The same trainset could travel 90 minutes and a total of 244 miles further east of Raleigh to serve Selma, Wilson, and Rocky Mount – making connections in both directions with the Silver Meteor to and from New York City... at only the incremental cost of miles and hours; more on that in a minute. Crucially, all the Frisco trains converged at Springfield with connections possible in every direction. If even one of those connections were inconvenient or broken, the usability of the trains would have collapsed. To see why, let's look at the matrix effect. As described in Dr. Adrian Herzog's paper "An Introduction to Matrix Theory for Passenger Trains,” for each of 'N' stations, there are 'N-minus-one' destination stations. So, absent the matrix effect, as two disconnected routes, the 18 stations on the St. Louis-Oklahoma City line, and the 25 stations on the Kansas City-Birmingham line, would have given (18*17)+(25*24) = 906 possible origin-destination pairs. But, with that connection at Springfield, the number of stations becomes 18+25-1 (Springfield being common to both routes) and the number of travel pairs becomes 1,722 – almost twice as many! If you moved the times of any train by a few hours, your revenue would drop by half. Or, if you think of each connection you can restore – your revenue would double! This applies equally to, say, the connection at Memphis to the Illinois Central – where the eastbound Southland easily connected to the southbound Panama Limited for New Orleans, with another good connection in the reverse direction. Again in the present, Amtrak, either on its own or convincing the State of North Carolina to extend the Piedmont to Rocky Mount – adding three stations to the current nine – changes that train's matrix from (9*8) = 72, to (12*11) = 132 ... nearly double. Counting the connection to the Silver Meteor and its twelve stations to New York, the number of potential travel pairs rises to (24*23) = 552. That's nearly eight times the usefulness, for the cost of a 90 minute ride. And, many of those would be lucrative trips of several hundred miles. Yes, we lapsed for a moment into fine detail we said could almost be ignored. Why? Because once you have a sufficient matrix, each little improvement builds the system far more than "linearly" – meaning each time you "add one" you might "get three or four more." That's why the concept of trains dubbed locals, expresses, and limiteds will work together toward a successful passenger rail system. 4) We note today’s date, September 11th, the anniversary of the unspeakable horror inflicted on our country and countrymen by those who don’t cherish freedom. September 11, 2001 was the day so many Americans, trying to go about their normal lives, needed a passenger rail system to step into the chasm caused by a grounded airline passenger system, and it almost wasn’t there. For many places in the country, it already wasn’t; there simply was no reasonable surface transportation alternative to the thousands of grounded airliners. What have we learned these eight years since 2001? Not much. Amtrak is carrying a few more passengers than it did then, but it still represents less than a half of a percent of our country’s domestic transportation marketplace. Very little new equipment has come online in the past eight years, and Amtrak’s route system has taken dramatic hits, such as the loss of the Sunset Limited east of New Orleans into Florida. Since 2001, Amtrak has replaced its president and chief executive officer three times, with the current officeholder working under just an interim appointment. There have been no substantial changes to Amtrak’s board of directors, and it remains dangerously under-populated. A rational person would have thought we would have learned something in the past eight years. 1) Do you choose greatness, or mediocrity? Do you choose a healthy, robust passenger rail system, or a continuation of the shame of Amtrak as we know it today? At the beginning of the 1950s, America still had the greatest passenger rail system in the world. By the end of the 1950s, that system, through the introduction of the Eisenhower Interstate Highway system and the Boeing 707, had started sliding first into depressing mediocrity, and then, by Amtrak Day in 1971, an abysmal black hole. Yet, we, as the greatest nation on earth, have accepted Amtrak because we’ve been told time and again it’s the best we can expect. Falsely, we’ve been lectured to that it was a matter of money. So many people have blindly believed that annoying canard. Falsely, we’ve been indoctrinated that passenger rail is rightly a child of government, because no one is smart enough to understand how to run passenger rail without the financial strength of government. Sadly, as a nation we’ve bought into all of this degenerate rhetoric because the glamour and glitz of passenger rail was snuffed out with the last runs of the Twentieth Century Limited, Broadway Limited, Super Chief, North Coast Limited, and Florida Special. We looked to the skies filled with jets from Pan Am, Eastern, National, TWA, and Braniff for our glamour and glitz. The Hunt Breakfast which used to be served in first class between Phoenix and the West Coast on Western Airlines replaced the spotless linen of the dining car on the Golden State of the Rock Island and Southern Pacific railroads. The siren of the complete freedom of the automobile tugged at the restlessness in our breasts and souls, ever seeking to explore new places and stay along the way in always dependable Holiday Inns and Howard Johnson’s motels instead of the slightly swaying bed of a Pullman sleeping car. In every Holiday Inn or Howard Johnson’s room you had a private bath and a shower. On a Pullman sleeping car, you had a lavatory sink for bathing. Instead of creating the next generation of long distance trains, we created child of government, Amtrak. Yes, Amtrak gave us Amfleet, but, really, is an Amfleet coach seat any more comfortable than a coach set on any previous Budd built or Pullman Standard coach? And, yes, Amtrak gave us Superliners and Viewliners, but, if left up to private innovation without the heavy hand of government regulation, what would we have had today instead from the private marketplace? We already had the Metroliner on Pennsylvania Railroad’s Northeast Corridor. That was a huge step forward; what else would we have had? Perhaps, a still functioning Pullman Standard passenger car manufacturing company in Chicago? American ingenuity instead of Canadian, European, and Korean ingenuity? Would we have had the disappointment of Acela trainsets without them being created by a company that was a child of government? Perhaps, if complete accountability had come into the picture, would the many trials and tribulations of Acela never have occurred? As a nation, we are on the cusp of perhaps the next golden age of railroading on many levels. Public and private partnerships are being forged where everyone is a winner. Private freight railroads are weathering the recession, and seemed poised to come back strong as business revives. In the meantime, more and more managers have come to understand there is money to be made in the passenger business. Most people have no clue how much activity there is currently in the private marketplace for new and innovative passenger plans. But, it’s there, all working in the glory of the free market system. If we’re fortunate, we as peoples of North America will continue to come to rediscover the many advantages of passenger rail on every level. Those with vision will rise to the top, leaving shuffling bureaucrats and negative attitudes of “no, we can’t” back in the dust. The day is coming. Are you ready? 3) Words, names, labels – they all matter when it comes to how we think about things. William Lindley of Phoenix, Arizona suburb of Scottsdale has a few words on the subject. There has been much hand-wringing about the terms "high speed rail" and "commuter rail" in the United States. This has occurred because most of the new "high speed" systems aren't really all that fast compared to Spain's, France's or Japan's, and because many of the new "commuter rail" systems have broken from the 1950s-think "inbound mornings, outbound evenings" schedules. This is evident in the August 2009 Railway Age magazine. Railway Age writes more about expansion of passenger rail across the country – with the sometimes supportive, sometimes grudging approval of the Class I railroads – than would have even been seriously considered as a guest editorial in a "fan" magazine like Trains magazine 20 years ago. Before we as a nation consider new services, let's look at how terminology and "old-think" have stifled the growth of passenger trains and transit for years. In my college years at Northeastern University in Boston, Massachusetts, I grew to be friends with the late George Sanborn, the "puckish" – the Boston Globe's word, not mine – librarian of the State Transportation Library. George, who started with Boston’s transit service, the MBTA, when it was still the Boston Elevated Railway, seemingly knew everything about the history and future of transit in the Bay State. He got me not just understanding the past, but thinking about shaping that future – he turned me from a "railfan" into an "advocate." Two things stand out which were gleaned from Mr. Sanborn – one, a 1904 map illustrating the "Steam Railroads and Street Railways of Massachusetts," and the other, the opening of the Alewife extension of the Red Line in 1984-1985. The latter made George laugh as he showed me the original plans to extend the Cambridge Subway – as the Red Line was originally known – very much along the 1980s alignment, to Arlington, and even as far as Lexington, and they were dated 1912! Clearly, the wheels of progress grind slowly. And as to that 1904 map – compare it to the modern MBTA "commuter rail" lines and the bus lines, and there are few differences. This despite that streetcars were in high competition with railroads for local passengers. Indeed, even today, local and express buses in Boston exist in almost complete denial of commuter trains. In my old hometown of Bedford, Massachusetts, there is no attempt by transit to connect the town with train lines which operate in Concord – just a few miles west – or to the Burlington Mall, three miles to the east, or either to Mishawum station in Woburn, 10 miles to the east. I then lived in Woodbridge, Virginia, where the onetime "Prince William [County] Commuteride" buses have been replaced by "PRTC" – which still runs express buses to the Pentagon, flying in the face of the fact Virginia Railway Express trains have existed since 1992. True, the Pentagon employs tens of thousands, but why is a public bus company designed to serve a single building, instead of the whole city? There are a couple local loop shuttles in Woodbridge, but they make paltry connections to the VRE station there... clearly, there is no thought of a transportation “system” – just a variety of disconnected bits. Countless examples surely abound across the country. So long as our transit modes, even ones operated by the same agency, refuse to co-operate and work as a local matrix, they will never fulfill their proper roles, and will waste billions of taxpayer dollars on inefficiency. Part of the problem is not just "we have always done it that way," but the terminology itself. Words are powerful. In my current hometown of Phoenix, Arizona – since 1991 – the transit system has improved much in 20 years, but still has far to go. I fought for years to get a "drop-off only" sign at the Valley Metro Route 532 express bus stop at Scottsdale and McKellips Roads removed... because even though the Bus Book said the bus stopped there, the drivers wouldn't let passengers – who had departed the morning bus there from Mesa to go to Arizona State University in Tempe or to work in Scottsdale – back on in the evening! The bus was designed only to carry people downtown, and the drivers were told not to let paying passengers on who wish to make the return trip. Amazing. This sort of foolishness persists today in newer "Rapid" buses, designed again as "commuter" routes. These Rapid buses run in from the west from 79th Avenue along Interstate10, about nine miles to the State Capitol at 19th Avenue, making local drop-offs downtown – and then turn around and run back to 79th Avenue empty... despite other Rapid buses from east Phoenix are arriving off I-10, making local stops downtown and running back empty to the east from the Capitol! Apparently, nobody is permitted to desire to wish to travel from west to east through downtown – as if there are no jobs in the west valley which attract east valley workers, or vice versa. Better to run empty buses in the mindset of transit managers! The same "commuter only" mentality has been turned on its head now that the same Valley Metro has surveyed the riders of its new trolley system. Not only did a near majority of train riders rarely, if ever, use buses previously, but most trips were not "commuter oriented," but trips to lunch, to visit friends, or just for fun. These trips were utterly missed by all the traditional projection models in the original design. Meanwhile, despite all indications these trains are used not for commuting, but for everyday, all-day travel – 35% of METRO riders surveyed are new to transit, and 40% use light rail to travel between home and a destination other than work – Valley Metro is forging ahead with an ill-conceived extension west in the median of I-10, which will have just two or three stops, each located unwalkably over a quarter of a mile from anything, with platforms surrounded by screaming, diesel-belching, tire-dust shredding-18-wheelers... stations sunken in the depressing concrete canyon which is a modern superhighway. This scenario, despite that "commuter rail" surely will run on the parallel Union Pacific tracks a mile or so away within a few years, and despite that Thomas Road, parallel to, and a mile and a half to the north of I-10, has the highest bus ridership of any in the system – Thomas being fronted by apartments, shopping, and offices along its entire length. Valley Metro refuses to give up the misguided highway routing and put the trolley where it would actually serve real people, instead of the imaginary commuter traffic models projected. Even more baffling, Valley Metro never gave its train stations any names – just intersection addresses. Instead of "Sun Devil Stadium," which is a landmark at Arizona State University, the adjacent station is called "Veterans Avenue and College Way" – a place even Congressman Harry Mitchell, formerly mayor of Tempe for years, had no clue where it was after he said he was off to ride the train. Is it any wonder the common man can't figure out how to talk about the stations? One magazine apparently gave up on such unwieldy names, and prints a map of the confusingly long names and then says, "This delightful restaurant is located at Station 7." All this shows why "old think" and the associated buzzwords "commuter rail" – even modern buzzwords like "regional rail" and "high speed rail" – need to be discarded. They encourage "wrong-think." (Please excuse my temporary lapse into Orwell's Newspeak.) The old ways and ill-chosen words lead not just in unease in the public's mind, but in the planner's mind, as well. Instead, let us take a cue from what worked before. Instead of "commuter rail" and "regional rail," consider Local Trains. Some of these, yes, serve commuters – but the emphasis is local, all day, every day, cross-town connectivity. Instead of "high speed corridor" trains, let us have Express Trains. And overlaid on this, instead of thinking "intercity train," which locks us into the early 1970s mindset – Limited Trains. Both historically in the United States and across modern-day Europe, it is the network – the matrix – of a variety of trains, which make a viable system. Europe's fast TGV, Thalys, or AVE trains depend on connections with local trains, streetcars, and buses to feed and distribute passengers to endpoints. In France, SCNF trains code-share with numerous airlines, permitting through-booking to a variety of French cities. Most important, high-speed operators like Thalys and AVE run both types of trains which make just a few stops between their endpoints, as well as some serving a few suburban stops and intermediate cities. Amtrak has attempted on several occasions to run non-stop endpoint-to-endpoint trains, such as Metroliners in the Northeast Corridor and in the Pacific Surfliner corridor. All these attempts suffered low ridership, partly because few passengers wanted to go only from downtown to downtown, but also because of missing, or poorly coordinated local train service. Perhaps today, with proper integration with Pacific Surfliner partner train services of Coaster, Metrolink, and Los Angeles subways, an express Surfliner might make more sense than a decade ago, but unless major intermediate stops like Oceanside are added, the matrix effect is so greatly diminished, such a service only would be reasonable as a supplement when the regular trains become over crowded. The Matrix effect – not just among trains of equal class but among all trains and local transit, is the driving force behind a successful national transportation system. Ideally, at major gateway cities – spaced across the country in a grid, each no less than 150 miles apart – limited trains from multiple directions would converge several times a day to permit transfers to all points... not unlike what airlines do with hubs. At these gateway cities, local trains would provide the links to the surrounding suburbs and smaller cities, while Express trains would give fast links for connecting passengers to nearby metropolitan areas. As the matrix of different trains and transit increases, and the number of daily trains increases, the need for Clever Scheduling decreases. Amtrak, traditionally having just one train a day on most routes, needs Clever Scheduling to operate its skeleton system. Yet, when each route sees two to four daily trains, there is always a train in a few hours... which solves many problems, from minor delays causing major inconveniences, to crew rest times and expensive overnight hotel stays at Amtrak's expense. When stations are staffed full-time, they cost less per passenger to run – even with a larger staff – than a station open just a few hours a day. The single factor hobbling rail ridership today is that you simply can't get there from here, with the exception of a few places depending where "here" is. If you live in Dallas, you can get to Oklahoma City, St. Louis or Chicago, El Paso or Los Angeles – and basically nowhere else. Let's see how that changes with a matrix. I've placed a sample "timetable" of sorts at http://unitedrail.org/images/20090908.html which shows just some of the places you can get to, with a single connection from a train in Texas, under the late Dr. Adrian Herzog's updated plan, as featured in this space in August. Indeed, in this snapshot chart, there are far more transfer points and far more intermediate destinations than can be shown on a single chart – but, if you compare this to today's connections (shown in red), there are many more x's in Dr. Herzog’s proposed matrix. As the number of destinations increases dramatically, and convenience increases when there is more than a single train a day to most places, the train becomes a serious transportation option for more and more travelers. Dr. Herzog wrote in 2000, "...interconnecting a network into a complex matrix of origin-destination pairs even at constant levels of market penetration drives increases in transaction volume (ridership) exponentially." Serious growth is unprecedented on trains in America since the advent of subsidized highways, but across Europe, ridership in many places is at or above historic highs, even as highway and air travel continue to be strong and grow. True, air ridership has dropped dramatically in places where high-speed trains now run; and indeed, Air France may bid to operate trains on SNCF's lines; but realistically, operating jetliners for distances of much less than 500 miles makes little economic sense. Once a plane and crew has spent the time and fuel to climb to altitude, it costs relatively little to fly a few more hours. This doesn't even count the maintenance expense and ground charges incurred with each takeoff and landing. Airplanes do what they do very well, and so do trains; but there is little overlap. In each metropolitan area, then, we begin with a base matrix of pedestrian access, bicycles, city buses, streetcars, and subways. Overlaid on this is a matrix of local trains, serving a greater metropolitan area with all-day, in addition to peak period, service. Overlaid on that are express trains which start on one side of a city, call at the downtown station and again on the other side, and make a few more stops into one or more cities down the line... calling at airports and selected city or suburban transit hubs, passing through the final downtown, and terminating on the far side of the destination city. The final layer is our limited trains – somewhat like today's intercity services – which connect the country from west to east, south to north, in a matrix, a grid so you can get there from here. Often these Limiteds may call only at one or two stations in each city besides the main downtown terminal, but they almost never make a single stop, except for major intermediate cities or destinations. The Limiteds must connect with the Express and Local trains, and directly with the airports, where possible. And, almost every Limited train, because there will be two to four of them each day on each route, will continue to serve small town America – places like Deming, New Mexico; Whitefish, Montana; and Alpine, Texas. In the wide open spaces of America, these trains become a mix of long-distance and local. You can already see this on today's Amtrak trains... sit in the lounge car and chat with a German tourist on one side and the college kid from Green River, Utah going to Lincoln, Nebraska on the other. The Limiteds are not endpoint-to-endpoint services – that's the oldthink – rather, they are the interconnection which make the whole underlying matrix work. 3) The latest from Ken Orski, at Innovation NewsBriefs. This is Volume 20, Number 17. For more information, visit www.innobriefs.com. Among the pressing legislative priorities facing Congress this autumn – besides the highly visible health care and climate change bills – is an extension of the federal surface transportation program. The program authority expires on September 30 and its renewal is essential to keep the federal transportation money flowing. As we reported in our NewsBrief of August 8 on the eve of the congressional adjournment, the House and the Senate have been on divergent paths in their approach toward renewing the program. The House Transportation and Infrastructure Committee, under the leadership of Chairman James Oberstar (D-MN), has been intent on passing a six-year $500 billion surface transportation measure ($450 billion for highways and transit, $50 billion for high-speed rail) during this session of Congress. In late July, a bill to this effect was reported out by the House Highways and Transit subcommittee. Chairman Oberstar announced at the time that he would hold a full committee mark-up soon after the House returns from its summer recess. The Senate, on the other hand, has been working toward an 18-month extension of the existing surface transportation program. Its rationale for doing so was succinctly stated by Sen. Barbara Boxer (D-CA), chairman of the Environment and Public Works Committee and Sen. James Inhofe (R-OK) ranking minority member. There simply is no way, the two senate transportation leaders concluded, that Congress could pass a multi-year authorization of the surface transportation program before the program’s expiration at the end of September. "There are just too many big questions left unanswered, not the least of which is a lack of a consensus on how to pay for it," Boxer and Inhofe stated. A better approach, they said, would be to pass an 18-month extension as recommended by the Obama Administration. Left unsaid were probably two other motives for wanting to postpone enactment of a long-term legislation: (A) an 18-month extension would allow the Senate to take a more active role in shaping the legislation and influence the nation’s future transportation policy; and (B) by early 2011, a more favorable economic climate might allow a significant boost in federal fuel taxes – a boost that both the Senate and the House leaders have ruled out during the current economic recession. Three Senate committees having jurisdiction over the surface transportation program (the Environment and Public Works (EPW) Committee; the Commerce, Science and Transportation Committee; and the Banking, Housing and Urban Affairs Committee) completed action on their bills to extend the existing program before the recess. Also approved was a measure that would effectively ensure adequate funding for the 18-month extension. The bill in question (S. 1474), sponsored by Finance Committee Chairman Max Baucus (D-MT), would replenish the Highway Trust Fund through a transfer of $26.8 billion from the General Fund. The funds were said to represent reimbursements for lost interest payments owed to the Fund since 1998 and for past disaster emergency expenditures. This briefly summarizes the situation as it appeared when Congress adjourned for the summer recess. What follows is an attempt to assess the likely course of events in the days ahead. Our analysis is based on conversations with sources on Capitol Hill and members of the Washington transportation community. The report presents a snapshot view of the situation as we see it at the time of publication in early September. Nothing can be asserted with certainty, however, until the Senate and House leaders have sat down and hammered out a negotiated compromise sometime during the month of September. Chairman Oberstar says he has a commitment from the House leadership to bring the bill to the House floor by the third week of September if the Ways and Means Committee can come up with the revenue title to the bill. That's a big "if". So far, the W&M Committee has given no indication where the money might come from. According to press reports, a majority of the members of that committee are opposed to any tax increases as a means of funding the proposed $500 billion bill. Significantly, only 15 of the 41 committee members went on record in a July letter to committee Chairman Charles Rangel (D-NY) supporting "prompt action" (i.e. in September) on a revenue package for the bill. In the opinion of many observers, hope for the enactment of a long term transportation bill this year all but vanished when Rep. Oberstar himself acknowledged that he does not favor raising the fuel tax at this time to pay for the $500 billion transportation program. He made this admission in testimony before a hearing of a House Ways and Means Subcommittee on July 23. "Although increasing and indexing the gasoline and diesel user fee is a viable financing mechanism, ... I do not believe that the user fee should be increased during the current recession," Oberstar stated in his opening statement, echoing the posture previously taken by the White House and Transportation Secretary Ray LaHood. Although he suggested other potential sources of supplementary funding, Oberstar deferred to the Ways and Means Committee. "The Committee on Ways and Means," he said in concluding his testimony, "must undertake the difficult task of identifying the revenue to finance this bill...We’ll take any dollar you can scare up for us for the trust fund." By taking the gas tax increase off the table, Rep. Oberstar acknowledged a political reality but also removed from consideration the most logical source of additional revenue. Other funding options appear limited. One solution could be to use general tax revenue to fund a transportation-focused "Stimulus II" bill . Such a measure might conceivably be rationalized as helping to bring down the level of unemployment – should high joblessness persist. A second option could take the form of a major bond issue to be financed by additional revenue generated from indexing the gas tax at some future date. Both options have been hinted at by Rep. Oberstar and Rep. DeFazio (D-OR) in past interviews. But political analysts do not consider either option as plausible, since both lack congressional and Administration support. Neither Congress nor the White House are eager to add to the already sky-high budget deficit. Several other funding options suggested by the T&I Committee leaders — such as imposing a fee on imported and domestic crude oil; taxing crude oil futures transactions (the subject of a DeFazio-sponsored bill, HR3379); and a flat sales tax on the purchase of gasoline — stand even less chance of congressional approval. According to Sen. Inhofe, he and Sen. Boxer have obtained a commitment from Senate Majority leader Harry Reid (D-NV) to schedule the 18-month extension bill for early floor action, possibly as early as the week of September 7. The bill also will serve as a vehicle for repealing the $8.7 billion rescission of federal highway program contract authority required to take effect on September 30. Prompt action on the extension bill is necessary, say Senate sources, before states take irreversible steps to cancel existing contractual commitments to comply with the spending cutback. Pressure to repeal the scheduled rescission has been intense. In late July, AASHTO sent a letter to members of Congress noting that failure to promptly repeal the provision would lead to "devastating consequences" for the states. Sen. Kit Bond (R-MO), author of an amendment to repeal the scheduled rescission, has been equally emphatic: All 50 states will face "drastic cuts" to their highway programs, he said, if the highway rescission is not promptly repealed. The cuts could lead to 250,000 jobs lost in the construction industry, Bond noted. Given an almost certain approval of the extension/rescission measure by the full Senate, the transportation community is rife with speculation as to the ultimate resolution of the Senate-House conflict. Undoubtedly, an extension of the existing program authority would provide more time to develop a broad-based consensus among the stakeholders on the needed policy changes and program reform. Such a consensus hardly exists today as our survey of transportation stakeholders has shown (see, NewsBrief, July 11.) Postponing the enactment of a multiyear authorization would also offer the Senate and the Administration a chance to participate more fully in the overhaul of the nation's transportation policy. This argument, we suspect, while seldom expressed openly, is probably in the back of the minds of many Senators and senior Administration officials. The current House version of the authorization bill has been developed with virtually no substantive input from the Senate or the Administration, sources tell us. Whether a full 18-month extension is needed or appropriate is a matter of judgment. It may be argued that a postponement until the spring of 2011 makes sense because passage of a gas tax increase will be politically more feasible in a post-recession economy. But others argue that getting a gas tax increase enacted in the spring or summer of 2011 is not going to be politically any easier. An 18-month extension would expire a mere three months after the start of a new Congress. With new faces and a possible political realignment in Congress, the extension could easily morph into a two-year or longer delay. This point of view has been emphasized by Rep. Oberstar: "An 18-month extension will just take us into the next presidential election cycle," he observed, "so it [the extension] will turn into four years." Since both houses and both political parties are anxious to keep the transportation money flowing, the current conflict will be resolved through a compromise. The House will most likely drop its insistence on passing a multi-year transportation bill during this session of Congress; in return, the Senate will probably consent to a shorter extension of say, 8 or 12 months— especially as there already is some sentiment for a shorter extension among certain senators. The compromise will be sought in a Senate-House conference before the end of September in order to avoid any disruption in the federal transportation program. Postponing the enactment of a long term transportation authorization does not have to mean a pause in searching for a broad consensus on a new vision for transportation policies and programs. Indeed, a National Transportation Policy Conference, to be held September 9-11 at the University of Virginia’s Miller Center of Public Affairs in Charlottesville, may mark the beginning of such a search. Co-chaired by two former Secretaries of Transportation – Norman Mineta and Samuel Skinner, and directed by former Undersecretary of Transportation Jeff Shane, the Conference will aim to develop "an informed, forward-looking, credible agenda to guide the legislative process." Panelists and invited participants include some of the best known and most highly regarded members of the transportation community. The Conference will begin by reviewing the current state of thinking about transportation policy reform by examining the recommendations of the two congressionally-chartered transportation commissions, and the reports of the Brookings Institution and the National Bipartisan Policy Center. It will then focus on four problem areas: funding, urban congestion, freight movement and multi-modalism. The Conference will conclude with a roundtable in which participants will develop a set of "clear, credible and achievable legislative and policy recommendations for a new transportation authorization." The Conference findings and recommendations will be presented to leaders in Congress and the Administration and to the editorial boards of major newspapers (they also will be featured in a special edition of the NewsBriefs). We think the conference will mark an auspicious beginning to a dialogue that will reach across ideological lines and develop a true bipartisan consensus on a "transformative" national transportation policy and program. 4) Some of the old silliness and modal envy is still hanging around, particularly in organizations which allegedly claim to help Amtrak. There is still whining about all of the horrible unfairness of it all; those mean, nasty, ugly highways are sucking up all of the money, and there is no money left to shovel into rail. After all, these ill-informed people say, no passenger system in the world makes money, right? So, why can’t passenger rail have more free government money? The only people saying silly things like that are people who believe in the nanny state, and government is the cure-all for everything, and government can solve all problems by spending someone else’s money. None of these people stop to have a rational thought or (Gasp!) come up with a real reason to support passenger rail. The real reason is not because highways get all sorts of money. The real reason is because a true case for passenger rail can be made through a rational business plan. It’s all about having a solid business plan which provides the greatest return on investment. It’s not about forcing people involuntarily out of their private automobiles, and it’s not about taking money away from air traffic control. It’s about showing people investment in rail provides a desirable alternative which produces results. The reality is, in this big, huge, endless horizon country of ours, automobiles are never going away. While smaller, more efficient cars may be suitable for city driving, big, brawny, oversized trucks and SUVs are best for rural driving and real work. Telling drivers of either to leave their vehicles at home and get on a train will only generate stares at you, with people wondering if you’re from another planet. Making comparisons to small-space countries like those in Europe, or pint-sized spaces with big populations like Japan makes no sense, either. After the devastation of World War II and the subsequent rebuilding, those spaces were rebuilt based on existing rail and rail cultures. After WW II here in North America, we, as a nation, chose to create the Eisenhower Interstate Highway system, and paired that with the Boeing 707 jetliner. Those choices created our current culture of transportation, which will last for generations to come. Nothing is going to change overnight. However, wise people such as former Federal Railroad Administration Administrator Gil Carmichael have come up with a plan, which he dubbed Interstate II. Interstate II take the innovation and formulas of the Eisenhower Interstate Highway system and applies it to rail for the twin benefits of freight and passengers. It’s a plan which makes a lot of business sense. It combines many of the best features of free markets and capitalism with the strengths of government to create a fluid, practical system of moving freight and passengers. Stop making the case for passenger rail based solely on what someone else receives in free federal monies. Make the case based on hard, cold, facts such as the overall lower cost of building rail infrastructure, better operations costs, and the automatic benefits which come with passenger rail development. Leave the whining to the other guys who have to work much harder to make their case. It has been demonstrated time and time again, whether on a local, regional, or national level, when the traveling public is offered a reasonable choice through passenger rail, enough travelers willingly choose rail without provocation, but simply through free choice. Free choice always make the most difference. 5) The always superb and informative Passenger Train Journal magazine has hit the news stands with its latest issue, 2009-3, Issue 240. Discerning readers may be interested in pages 30-33, “A fresh look at Amtrak’s map,” which is a condensed version, with a delightful map, of a previous This Week at Amtrak issue from earlier this year. As always, the gentle hand of editor Mike Schafer has produced a most satisfying product.